If you’re an EMS worker, you understand the importance of great footwear. Rescue workers are often on their feet throughout the day. Furthermore, the job puts workers in very precarious situations. 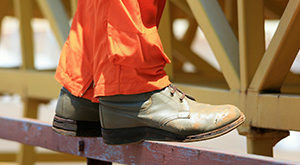 High-quality boots will ensure that the feet stay safe and comfortable regardless of where the job may take you. Boots are put through a lot with the daily grind of EMS work. In fact, it’s not uncommon for workers to need a new pair every couple of years. When the time comes for a new pair of EMS work boots, there’s a lot to consider. 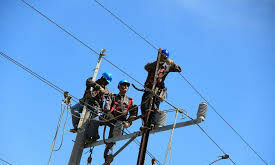 In addition to comfort, work boots should be made of durable materials and include a variety of safety features. 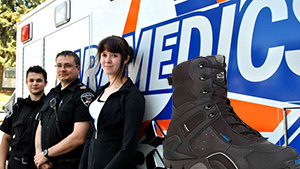 As one of the most important tools of the job, superior EMS work boots are a worthy investment. Even when you’re not saving lives during work hours, these boots are versatile enough to serve you on a hike, working in the yard, and much more. 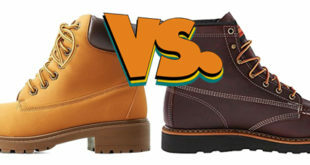 While there’s a wide variety of work boots available on the market, here are nine of the best options to get you through the work day. From Rocky is this pair of durable work boots. They’re made from a combination of full-grain leather and durable Cordura fabric. The thick rubber sole provides adequate grip on a variety of slippery surface. The Lenzi rubber outsole is also puncture resistant. It can keep you safe from sharp objects while improving the overall durability of the boots. Another unique safety feature is its resistance to bloodborne pathogens. The boots also have a composite toe. The entire shoe is free from metals, making it safe from electrical hazards. In terms of fit, the shoes feature both laces and a zipper for a customized fit and quick removal. When it comes to comfort, these boots from Thorogood are great for all day wear. 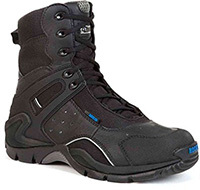 The boots feature a Dri-Lex Aero-Spacer liner. The liner wicks away sweat and moisture for optimal comfort. There’s also an EVA cushion midsole to support your arches and prevent fatigue. The boot rises 8.5 inches above the ankle to provide ample protection and support. Covered in durable leather, the boots are durable enough to withstand a lot of wear and tear. There’s also a thick 1-inch platform sole to protect the feet from punctures. Long laces and a velcro strap make it possible to get a snug fit. 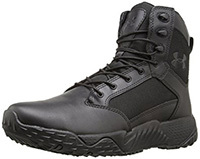 These durable boots from the trusted brand Under Armour are flexible enough for a variety of uses. They’re made from both leather and breathable fabric. The leather is treated for looks and durability. The fabric 900D nylon provides ventilation to keep the feet cool and comfortable without sacrificing protection. The thick rubber sole is outfitted with a textured grip to make getting over any surface a breeze. There’s also a TPU shank hidden within the sole for more support. The boots are lined with an anti-microbial material. It prevents the growth of mold and bacteria to prevent odor. 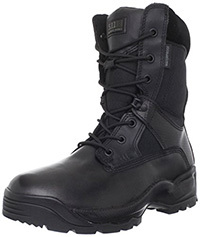 Designed with performance and protection in mind, these boots are a great option for EMS workers. 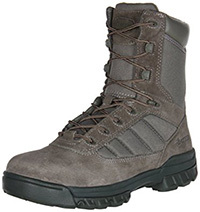 The body of the boots are made from full-grain leather and nylon, making them very durable. Inside, the boots have a molded Phylon midsole that supports the foot, extra cushioning, and a lining that prevents moisture buildup. The anti-microbial lining wicks sweat away while the closed-cell foam used throughout doesn’t retain moisture. The thick sole has a shock mitigation system and rigid shank to improve performance. It’s also designed with unique treads to prevent slips. 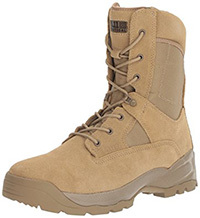 To improve fit, the boots have durable laces and a strap fastener. Another great option from 5.11, these boots have a slick and professional appearance with a high-quality design that can help to improve job performance. Made from full-grain leather and tough Cordura nylon with triple stitch construction, the shoes are durable enough to withstand years of use. A full lace enclosure allows you to get a tight fit while the side zipper makes it possible to throw the boots on at a moment’s notice. There’s even a hidden side pocket on the boots to house small tools. The boots feature an injected midsole, anti-microbial lining, and prone position grip on the soles. 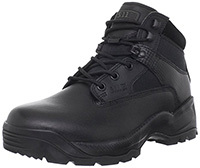 These tactical boots have a shorter design that doesn’t confine the lower leg. At only 6 inches high, the boots are more comfortable to wear and provide a better range of motion while still providing great protection. Leather and a breathable fabric are used on the body of the boots. The fabric lets air in to aid with the anti-microbial lining. As the air enters the shoe, it wicks away moisture. This is done while keeping liquids from entering the boots. The thick synthetic sole has a non-metallic shank and a slip resistant design to prevent you from falling. These boots from Bates are lightweight and comfortable to wear all day. However, they have a number of great features to improve safety and durability. Leather and nylon are used to keep the feet protected. A mesh lining inside keeps the feet dry. There’s also an EVA footbed for support and cushion. It’s removable for easy cleaning. The footpad also has pads to absorb shock and a shank for extra support. The slip-resistant outsole is made from thick rubber but remains about 30% lighter than other options. It’s a stealthy and light option that improves performance without sacrificing the protection you need. Available in a variety of sizes, including wide fits, these shoes make it possible to get the right fit for you. It’s slimmer than other options but provides great support. The boots rise approximately 8 inches above the ankle to protect up to the middle of your calf. The most notable feature of the boots is the Vibram sole. It’s thick and provides great shock absorption. The sole also improves your grip on any surface, wet or dry. The outside of the boots are made from polishable leather and breathable fabric. It’s completely waterproof and features a Gore-Tex liner to keep the sweat at bay. From Maelstrom is this short 6-inch boot. It’s made from durable leather and nylon. The leather is easy to clean and can be polished to an impressive shine. The nylon is tough, yet breathable. To add further protection, the boots feature a composite toe cap. The cap meets ASTM safety standards. A Dri-Lex liner inside works overtime to make the boots 100% waterproof. The membrane keeps water out while still offering ventilation to keep your feet dry. The shock absorbing insert cushions the foot to prevent fatigue. It can be removed fairly easily for replacement or cleaning. The outsole is made from rubber and features a slip-resistant design. 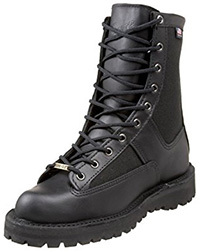 EMS work boots come in a variety of styles and build qualities. It’s important to examine boots and their many features to ensure that they’re suitable to wear on the job. Here are some important things to consider. Numerous laws and regulations are in place to ensure that EMS workers are kept safe through any assignment. As mentioned earlier, the job has a number of hazards to look out for. 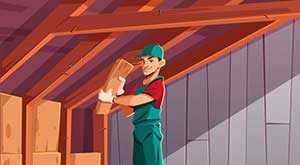 Workers must stay safe from glass, fluids, slippery surfaces, and much more. The ASTM has set standards to make it easier for buyers to determine how much damage boots can take. This is done through strict testing and ratings. Some ratings to pay attention to include impact and compression. Boots are often built with extra precautions to help prevent injury from drops. Steel or composite toes create an effective shield around the toes. To ensure that these shields don’t compress and break, manufacturers also have tough plastic plates on the bottom of the shoe. This system is tested with impact and compression tests. As an EMS worker, you should go with shoes that have an impact rating of at least 50 or 75, which represents the protection from a falling object’s weight. With compression ratings of 50 or 75, shoes can withstand compressive loads of 1,750 pounds or 2,500 pounds respectively. Another safety feature to consider is the traction the boots provide. Bad weather conditions, smooth surfaces, and biohazards can make it very easy to slip. With EMS workers being responsible for moving patients quickly, slipping is not an option. Luckily, most manufacturers include soles made to improve grip on any surface. These thick soles have unique designs that redirect liquids away from various points. This decreases the surface area that makes direct contact with the liquid, ensuring proper traction on the floor. Because the sole is so thick, it also helps protect against sharp objects and rough terrain. When paired with a durable shield and support layer, you’ll have the protection needed to stay safe. To work fast, boots should have adequate flexibility. While stiff work boots are great for other professions, they can be dangerous when you need to move fast. Stiff boots will limit your movement and prevent you from achieving the full range of motion needed to work quickly. While flexibility is great, the shoes should still have some support in the ankles. There’s nothing worse that making a quick turn and spraining the ankle. Boots should cover and support the ankles during quick maneuvers. Because you’ll be on your feet for hours on end, go with an option that’s comfortable. A number of factors go into comfort, including fit and materials. Make sure to get proper measurements to ensure that the boots fit correctly. They should be snug without constricting the foot and limiting motion. Many manufacturers make wide options to accommodate those that typically have issues finding comfortable shoes. Many boots also come with adequate padding and cushioning. Gel insoles can help absorb the force of impact. Some insoles also help to support the arch of the foot for prolonged wear. Additional features like a zipper and quick-release fasteners make it possible to get a customized fit without having to spend a ton of time with laces. You can get the shoes on and off in a matter of seconds with no problem. When it comes to materials, it’s good to go with something that’s waterproof and moisture-wicking. Waterproof materials will prevent water and dangerous liquids from entering your shoe. This will help prevent bacteria from growing, which will improve comfort and durability. Moisture-wicking materials will keep your feet cool and get rid of any uncomfortable sweat. This is done while also keeping water out of the boot. This will ensure that you stay both comfortable and safe at all times. When your out on an assignment and saving people’s lives, the last thing you want to worry about is the quality of your boots. 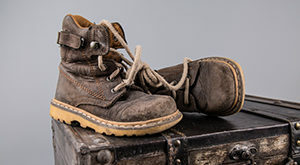 With a high-quality pair of work boots, you can rest assured that your feet and well-being are kept safe and protected no matter what you’re doing. They’ll make it possible for you to perform your best without giving it a second thought.